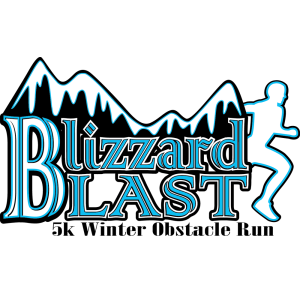 Last year, we were THRILLED when we took forty some people to Blizzard Blast (http://blizzardblastrun.com/) – a winter themed obstacle course race. We were THRILLED when they made us a flag (which I still have today! ), and gave us a space at the event. That event was fun, not too challenging, but they did a lot of things right, for their first year. 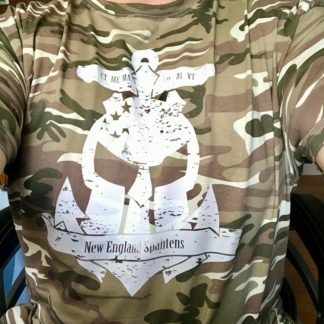 So, it’s 2014, and if you missed the memo, we got bigger, and Smithfest Events has held other events that we enjoyed very much, and oh – 120+ people this time. That’s a lot of Spahtens, and Fred Smith, owner of Smithfest and Blizzard Blast had a big reputation and bold claims to live up to. 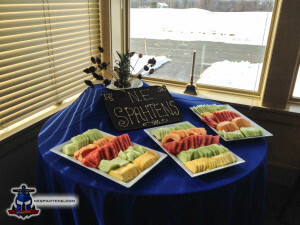 Blizzard Blast 2014 was hosted by the Four Oaks Country Club, an easy to find venue in Dracut, MA. Parking was a short bus trip away and cost a meager $5, and for my experience, checkin was super easy, in a big heated outdoor tent. I signed my waver, gave them my last name and ID – was handed a packet with everything in it and pointed to the T Shirt table to pick up my white cotton long sleeved Blizzard Blast shirt – and perks of being on the biggest team, we also received a pretty special NE Spahten embroidered scarf – which Fred had his family up until 2am ironing Blizzard Blast and Panic in the Dark patches on! 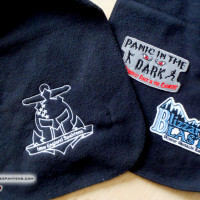 We said it at the last race, but Smithfest LOVE to look after their biggest supporters, and the custom Panic in the Dark T Shirts, and now the custom Blizzard Blast scarf go a very long way to building raving fans. Race Directors take note. We can be bribed. 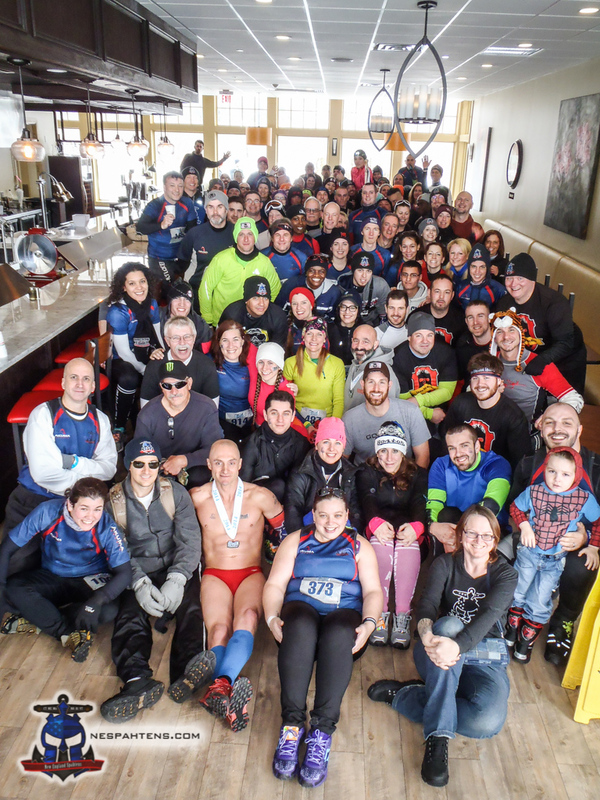 The Four Oaks Country Club was pretty packed – Blizzard Blast had attracted over 700 runners and their friends, and the place was pretty packed – with a nod to the cold temperatures of the season, everything was indoors (fortunately! ), with the main ballroom having a bar, band, Edible Endurance (run by Elite New England Spahten, Joe Benoit) and schwag table (that I never made it too! boo! I wanted a Blizzard Blast beanie!) – I didn’t see much of this room, because another perk of biggest team was a reserved room, with its own bar, fruit basket and giant chocolate signage. See? We can be bribed. This room was quickly getting packed as more and more Spahtens arrived, and we started to layer up for the team wave at noon. Despite the packed space, we manage to find a spot for one of the more epic team photos we’ve had to date – HUGE thanks to the staff and crew of Grazie, the public restaurant attached to the country club – the owner not only consented to letting over 100 Spahtens use her space, but also got up on a chair with the camera and took our photo for us! Our time came around, and we crossed the street to the start line. Being such a big team, we had been split into two waves running a few minutes apart – and I was very much looking forward to this. 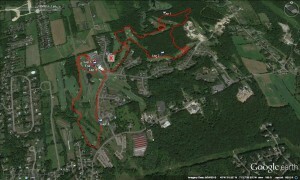 Promises of it being much tougher than last year, recent snow falls, and a longer than promised distance were all ahead. It’s always happy news when I write one of these reviews and say they delivered. The course was 4.3 miles long, according to my GPS, the snow was fresh, and off the already trampled trail was a good ankle deep powder that was hard work to slog through. Smithfest stepped up with the obstacles. We saw some very traditional obstacles – rock hops, a couple of walls, a through wall – and some nice themed variations, including a Christmas Tree tunnel and marshmallow toss. But what really works well here are the unique, Blizzard Blast special obstacles. We had two sled hills – get from top to bottom on plastic saucer sleds, then back up again. A TON of fun, and nothing like you’ve seen anywhere else! Snowpocalypse was hardly an obstacle, but a fantastic tie in with the other Smithfest property, Panic in the Dark. Some very good zombies jumping out on people, with some nice gory blood streaks in the snow. Props to the ice skating Zombie! There were also obstacles that stepped the difficulty up – they had built out and setup a very nice variation on the traverse wall – traditional blocks in the wall, which transitioned into a cargo net, which transitioned into a wall made of tires. Slightly worrying when you approach an obstacle and a fellow racer is on the ground with a dislocated limb … he did manage to pop it back in and carry on – a nice reminder that even something as simple as a traverse wall can be perilous if you aren’t wary! Blizzard Blast also installed a very unique variation on the monkey bar – a bunch of hanging metal beer kegs, suspended by the handle on one side, you had to swing from keg to keg to planks – three or four times. To finish the event off we had the signature Christmas tree carry … all sizes of Christmas trees to pick up and hike a 1/4 mile loop – Corrine and I ended up buddy carrying the biggest one they’ve got through the loops, which was fun! Once you dropped the tree, you wriggled through some tunnels supplied by the Zombie Charge boys, over some nice and icey snow piles and over the line! Blizzard Blast handed out a pretty medal, water and fruit right at the finish line, where we also had to remove our Racemenu shoe tag – and back into our reserved space for a free beer and to enjoy the food and entertainment. 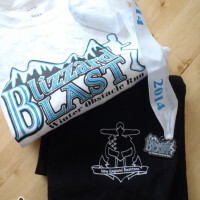 Blizzard Blast was the first OCR of the 2014 calendar, and kicked things off well. They really work well with, and listen to the community, adding some challenges to the course beyond the winter/snow themed stuff they were already known for and keeping things moving forward. 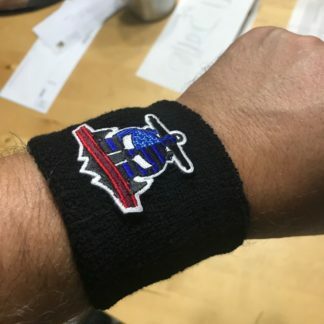 These days, it’s not enough for an OCR to shoot for “easy” and throw a couple of walls on a 5k running course, and without a solid identity and theme – and a challenge that keeps people interested and engaged you won’t be putting races on for very long. I expect Smithfest Events and Blizzard Blast to be a staple of the race calendar for many winters to come. 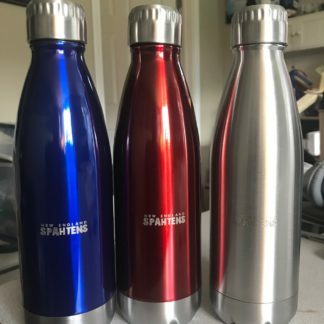 This was my first run as a Spahten, I was totally impressed by the privelages and the teams welcoming ways that made me feel at home and not a complete stranger. 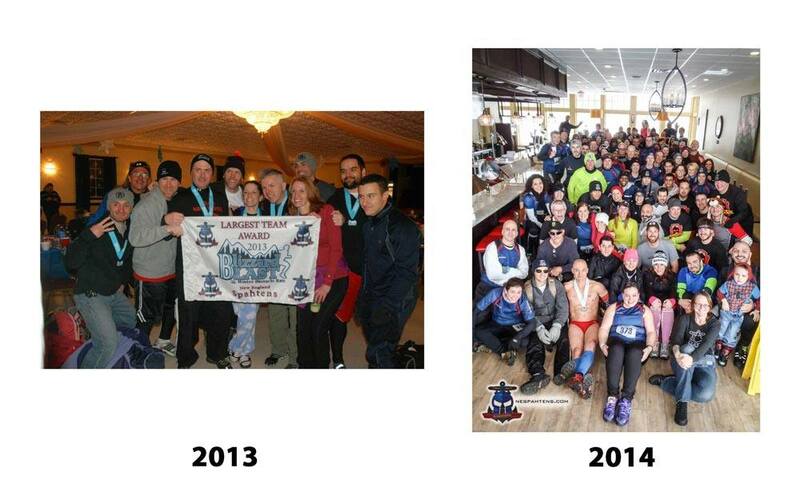 That one run created friendships that lasted all 2014 and made my OCR year so unbelievable. Will definitely be doing this next year. Definitely a fun race, very creative and I can't wait to do it again next year!! !